This is last edition of a 4-part series previewing the 8 teams in the World Cup of Hockey. Part 1: Team Canada/Team Europe – http://thesportscrew.com/2016-world-cup-of-hockey-preview-part-1-team-canadateam-europe/). How Can Russia Win The World Cup? Offensive Firepower – As is the deal with most international hockey tournaments, Team Russia always has one of if not the most gifted forward groups in the tournament. The story is no different at the World Cup; this is a group with a mix of the elite superstars like Alexander Ovechkin, Evgeni Malkin and Pavel Datsyuk with up-and-coming stars like Evgeny Kuznetsov, Artemi Panarin, Vladimir Tarasenko and Nikita Kucherov. In a talented offensive group with Finland, North America and Sweden, the Russians have the best of them all and has the potential to score in bunches. After having ugly performances in the last 2 Olympics, the Russians are hoping their high octane offense is enough to take them to the medal round and beyond. “DPS” Line – NHL fans became very familiar with Hawks rookie Artemi Panarin this season and saw what a spectecular player the 24-year old is going to be. These fans may not be as familiar with his linemates in 27-year old Evgeny Dadonov and 29-year old Vadim Shipachev, but you will certainly know them after this tournament. I have dubbed them the “DPS” line from the initials of their last names, but their chemistry on the ice goes back to Panarin’s KHL days with St. Petersburg. This line has played together in the KHL and for Russia this summer in the World Hockey Championship, where they finished 1-2-3 in scoring in the tournament respectively. They are another wave of offense for Team Russia, Look for them to make a big impact in this tournament. Russian Youth Movement – I talked about it briefly above, but Team Russia really has the best of their top-end talent and future talent all on one roster in the World Cup. We all know the likes of Ovechkin, Malkin and Datsyuk and how good they are, and it’s no surprise Oleg Znarok will lean on his veterans in this tournament. But it’s time to pay more attention to the likes of Kuznetsov, Panarin, Tarasenko, and Kucherov, all 25 or younger and the future of Russian hockey. These guys are ready to make a serious impact in this tournament, and it’s an exciting time for Russian hockey fans. The core of Russian international hockey is shifting in the next few years, but with these young stars playing for them at the World Cup and beyond they are in great hands for the foreseeable future. What Would Keep Russia From Winning The World Cup? Snipers M.I.A – Part of the new youth movement of Team Russia made some of the roster decisions very difficult for GM Andrei Safronov, including not choosing veterans Ilya Kovalchuk and Alexander Radulov. Both of these guys have been mainstays on the Russian International team the last decade; Kovalchuk was on the last 4 Olympic teams (2002, 2006, 2010 and 2014) and has played in 10 World Hockey Championships, while Radulov was on the last 2 Olympic teams (2010, 2014) and has played in 5 World Hockey Championships himself. It will be interesting to watch if Russia’s offense struggles without the 33-year old Kovalchuk and 30-year old Radulov, but it will be up to their young guys to step up to the challenge in their place. Questionable Goaltending – Team Russia certainly has a talented group of goaltenders in Sergei Bobrovsky, Semyon Varamov and Andrei Vasilevskiy, but a group that is also very inconsistent at the same time. Bobrovsky and Varlamov both have struggled the past few seasons in the NHL, and Vasilevskiy is only 22 years old despite early success with the Tampa Bay Lightning. The bottom line is that Russia really doesn’t have a #1 guy here, any of the 3 goalies could be in the net and if Russia struggles might end up all playing. Goaltending has been a big problem for Russia in international hockey the last few years, including a poor 5th-place showing at home in Sochi in 2014. If they want to win the World Cup, they need one of these guys to step up and be the #1. Young Defense – Team Russia is very top-heavy team with the bulk of their high-end talent coming on forward, and it’s no secret that they have a very average defensive group. Beside being an average group they are also inexperienced in international hockey, with just Andrei Markov and Alexei Emelin playing on the team in Sochi in 2014. Head Coach Oleg Znarok is going to rely heavily on the Candiens duo of Markov and Emelin as the only veterans on defense, with all 5 other defenseman being 25 or younger. Team Russia has a very offensively-talented group with Finland, North America and Sweden and that could spell trouble for this young, inexperienced blueline. As was the issue in 2010 in Vancouver and 2014 in Sochi, the weak link for the Russians is on defense. How Can USA Win The World Cup? It’s Showtime – Team USA will rely heavily on superstar Patrick Kane, the reigning Hart and Art Ross Trophy winner, in this tournament. After all the 27-year old Kane lead the NHL in scoring with 106 points this season, including a career-high 46 goals. He was so dominant this past season that he finished 17 points ahead of the next closest player, and don’t be surprised if he leads the World Cup in points. There are a lot of offensively-gifted players in their Group with Canada, Czech Republic and Europe but Kane is a must watch every time he takes the ice. 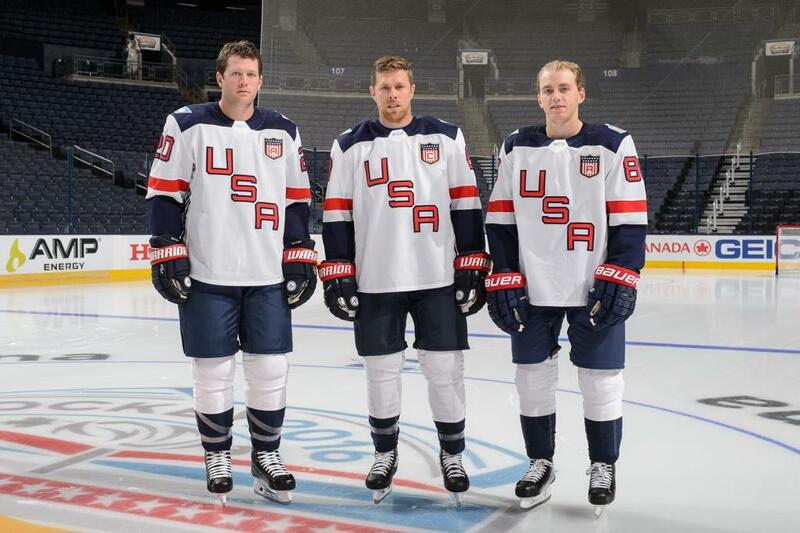 Team USA will go as far as #88 will take them, but Kane is capable of leading them to a World Cup win. Top-Notch Goaltending – Perhaps the best strength for John Tortorella’s team is their goaltenders, 3 of the best in the NHL in Jonathan Quick, Cory Schneider and Ben Bishop. All 3 of these guys are capable of being the #1 goalie, both Quick and Bishop were nominated for the Vezina this year and you could have made a strong case for Schneider too. Torts is giving the initial start to 2-time Stanley Cup winner Jonathan Quick, and we all know that when he’s on his game he’s almost impossible to beat. Quick will be a busy many between the pipes for the Americans in the World Cup, and it must be great for Tortorella to know he has Schneider and Bishop as insurance. Effective Powerplay – The Americans certainly have the talent in their top 6 forwards, Pacioretty-Pavelski-Kane and Parise-Kesler-Wheeler are lines capable of scoring in bunches. They also have some weapons on their blueline in Dustin Byfuglien, John Carlson and Ryan Suter, guys who generate a lot of offense. Tortorella has the right mix for a strong powerplay unit, especially with the big blast of Byfuglien and Carlson on the point. As I mentioned above, all of their offense will run through Patrick Kane, a guy who lead the NHL with 37 powerplay points this year. If Tortorella can get his powerplay going early in this tournament, this could be a nightmare for opponents to defend. What Would Keep USA From Winning The World Cup? Notable Roster Omissions – Let’s just throw this one out there; how in the world is Phil Kessel not on Team USA? You could make an equally compelling argument for guys like Tyler Johnson, Kyle Okposo, Justin Faulk and Kevin Shattenkirk and why they should be on the team, but it’s almost a joke at this point that Phil isn’t playing in the World Cup. Kessel silenced his critics winning a Stanley Cup with the Penguins this year, and he’s one of the best wingers in the NHL. He should be playing on the top line with Joe Pavelski and Patrick Kane, yet Tortorella is left mixing and matching players on that line and nothing has worked. If USA wins the World Cup then bravo to Torts, but the reality is he’s stubborn and stuck in 2004 and passing on a guy like Kessel will come back to haunt him. Torts Gone Mad – See above about Tortorella, but many wonder why he’s even coaching in this tournament? My theory? USA hired him when he didn’t have a job to get him back in hockey, now he’s with the Blue Jackets and people remember how crazy he is. I know Dean Lombardi makes the decisions as GM, but he clearly based them off Tortorella’s preferences and that’s why guys like Brandon Dubinsky, Justin Abdelkader and Jack Johnson are on the team instead of the omissions mentioned above. There’s no question USA needed to change their style after poor international play the last few years, but Tortorella seems too focused on grit and toughness and not enough on the top-notch skill in the tournament. If Team USA struggles to score goals in the World Cup, choosing grit over skill will be the main reason. Average Defense – The 7 members of the blueline on Team USA are an experienced group, all of them are 26 or older and NHL regulars. But it’s a group that really doesn’t WOW you on paper, one that is not particularly offensive and lacking a true #1 defenseman. Sure they have guys like Byfuglien, Carlson and Suter who can generate offense, but they don’t have a difference-maker like Canada has with Doughty or Sweden has with Karlsson. In fact Byfuglien (19 goals) and Erik Johnson (11 goals) were the only ones of the group who passed 10 goals this season, and it’s going to be a challenge for the Americans to generate offense from the blueline. Team USA left two of it’s best offensive-defenseman in Justin Faulk and Kevin Shattenkirk at home, and their blueline might be the weak link that dooms them. Enjoy the 2016 World Cup of Hockey!